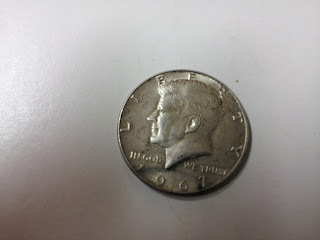 Paul E. Zimmerman.com: Urban Prospecting: I Struck Silver! Urban Prospecting: I Struck Silver! Somewhere recently I read someone's great idea about how you can acquire silver risk-free. It sounded like a bogus claim at first, and the promo video that went on and on and on (probably ending not in the promised advice, but with a paypal button to purchase an e-book) started to convince me that it was so. The seller, whoever he is, did give away the secret to anyone paying attention to detail, however: the sales pitch kept saying "say these five magic words to any teller at any bank and blahblahblah." I don't know what the words actually were because I stopped listening and started Googling. It didn't take me long to find out what the deal was (and why this e-book wouldn't have been a deal at all). Very simply, what some are doing (and what I've since tried) is to walk into any bank with some cash and proceed to exchange it for as many rolls of U.S. half-dollar coins as you can. There was a point in time where some of our coins contained precious metals, mostly silver. For a period of time, so too did half-dollar coins. Basically, any of them that were struck before 1971 have a significant amount of silver in them (for the specifics, use this handy resource, which will even tell you day-to-day what the "melt value" of a coin is). What's nice about doing this is that if you don't turn up any pre-1971 half-dollars in the rolls you buy, you don't lose any money. You can spend them, deposit them back into your bank account, or even exchange them for other rolls of half-dollars and keep looking. If you do find a silver-containing coin, however, you make a nice gain. A 1967 half-dollar, probably from the Pennsylvania mint (this one does not bear a mint mark, and it is my understanding that coins from that particular mint often have no mark, while the other mints always stamped them with theirs). 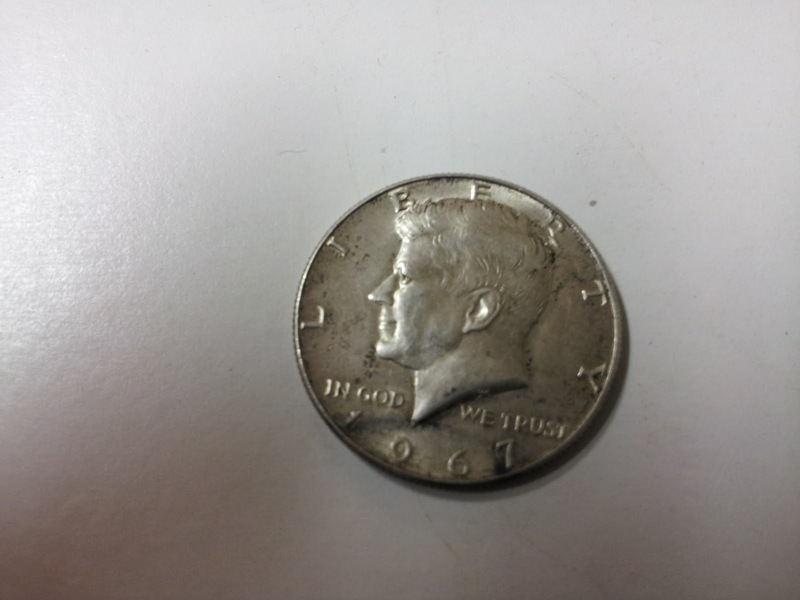 On the day that I found this coin, the spot price of silver placed the melt value of it at about $5.10. For fifty cents, I acquired something worth over nine-times that amount, without risking a single penny. It's tough to beat that! My coin is now hanging out with the rest of my silver holdings in my safe deposit box. As the use of silver continues to outpace the production of it, I expect the metal to continue rising in value. My existing holdings I acquired for an average cost of about $14.28 per ounce, but with a method like this one for acquiring more, I wonder if I can nudge that number down further. Thanks. I got here from Google. WND sent me some stupid email with an hour long rambling advertisement about "saying 5 magic words" to get free silver. I figured it was a scam. You sound like you have watched the video and figured it out. Thanks for saving the time. I might try this, because I like coins anyway. I don't care for collecting them, so I'll gladly dig through them with my kid and then spend them like I would have normally spent the money. Anyway, I watched enough of the video to figure out that the silver likely involved in this activity is contained in legal tender forms, which I already knew to be only good for their face values. Banks are certainly not going to just give precious metals away... unless they have to. In the case of U.S. coins, obviously, they just have to. I came to that conclusion after maybe one or two minutes of watching that awful video, so I applied some Google Fu and sure enough, there is was: go ask for half dollars. My first attempt and first success has thus far been my only success. I haven't tried it many times since, maybe once or twice, so one might have better luck with more attempts. The gals that work at the bank branch I do my business banking through tell me that people come in there placing obnoxious orders for hundreds of dollars worth of half dollar coin rolls, which they then burden the bank with by returning the "rejects" soon after. That necessitates asking your banker where the rolls they have on hand came from. If they came from people who just happened to exchange them, or if they are recent arrivals from a Fed reserve branch, you could be in luck. If some other urban prospector just turned them back in, then don't even bother taking any home (you might get lucky and find something they missed, but that's unlikely). Good luck and happy hunting! Yes, it is illegal to destroy legal tender. That's why the 90% half dollars were reduced to 40%, because people tended to melt them down rather than spend them. What I'd do with one now, and what I did do with the 40% half dollar I found, is tuck it away somewhere safe. In a conventional transaction (by that I mean business transacted in our normal economy), it's worth just 50 cents. In an unconventional transaction (whatever scenario that may entail), it could be bartered with on the basis of the value of its silver content instead. Or in a conventional sense, perhaps a silver collector would pay for it on that basis, too, rather than its face value. It's an open secret that refined silver supplies are experiencing a crunch, a trend that some say is only going to get tighter in the future. I think that makes it worthwhile to hang onto these things whenever you find one for the value of what's in it, not what's stamped on it.